The old Climbing Center is closed. You can find the new Climbing Center at Kristinebergsgatan 12 (Mullskopan)next to Coop. We are opening the center for public in december. For more information call Stefan +46 73 0213738 or Jim + 46 70 4237229. The price includes climbing shoes, harness, top rope with GriGri and the help of one of our instructors Youth up to 20 years 30: – Adult: 50 – 10 cards Youth 280: – 10 short adult 480: – Semi Short Youth 750: – Membership includes Interim Short adult 850: – Membership includes year card Youth 1350: – Membership includes year card adult 1600: – Membership included Family Card year 1 adult + 2 children in 1850: – Membership included. 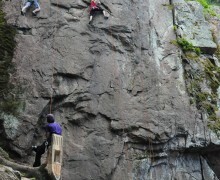 Have your birthday party at klättercentret with two hours of climbing and with a personal trainer. All climbing equipment is included such as harness, shoes. Up to 10 children 600: – over 10 children 700:- Other groups, ask for quote. Call 0490-37466. As a rule, the user group to climb for an hour and then pause for opening gifts and eating cake and drinking juice or something else and finally climb. We have approximately 300 sq bouldering with 60 marked trails of different difficulty levels resulting grip color. There are many gradients, angles and modules that make climbing varied and interesting. There are 12 solid top rope with a gri-gri fuse. The ropes hanging from the top anchor and is always ready for climbing. The walls are like a maximum of 10 m and has 30 marked trails. We have 300 sq medlodrät, overhanging and takklättring. There is also a small overhanging wall designed for lead climbing. 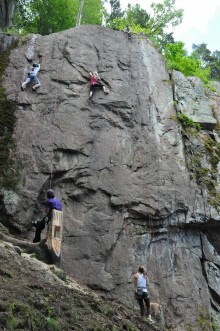 for climbers is klättercentret in Västervik. There you can connect to free wireless internet, or borrow a computer. A place to meet, share experiences, read klättertidningar see klätterfilmer and get current information about climbing in the region. Get information on the second active ether as in the municipalities. A place where climbers in bad weather can climb inside and get to know other climbers.